As a non-Lutheran who has a lot of interest and appreciation for Martin Luther and his theological tradition, I was interested in how a Lutheran would lay out the basics of understanding the Bible. McIntosh wisely starts off by pointing to Jesus as the “Star of Scripture” He goes on to explain how confessional Lutherans understand the nature of the Inspiration of Scripture (verbal, plenary, and inerrant). McIntosh also spends time explaining why Scripture is trustworthy. The chapter on the Old Testament is equally helpful while keeping the simplicity found within the intention of the book. For example, the first section on the Old Testament starts, “TaNaKh. Funny name. Serious substance.” Scholars may squabble over McIntosh’s breakdown of the Mosaic Law into the tripartite typical of popular level discussions (civil laws, sacrificial/ceremonial laws, and moral laws), but overall his treatment fits well and actually avoids getting too deep into the Gospel/Law distinctions that often are immediately discussed by Lutherans. In my estimation, this is a wise choice since the intended audience would probably get lost in the theologizing and that wouldn’t serve the purpose of the book. Rather, the focus remains on the basics. Even his very brief explanation of Revelation, the final book of the New Testament, is easy to understand… despite the enormous amount of scholarly literature on the apocalyptic genre! Good job, McIntosh! The last two chapters are very practical. The author encourages readers to expect the Holy Spirit to work through and alongside Scripture and to be willing to ask others for help when we do not understand. I’ll be honest: I was impressed with the substance found in this short book. The interaction with Scripture is good and it makes sense that McIntosh would make use of the Augsburg Confession. After all, he’s Lutheran, right? 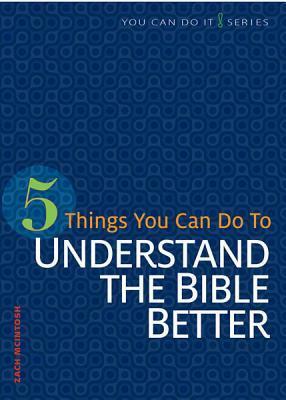 So if you are looking for something a bit more simple and easy to read than Fee and Stuart’s introductory How to Read the Bible for All Its Worth, you might want to consider picking up McIntosh’s 5 Things. It’s super readable and extremely clear. The minor differences that some may have are so minor that it’s worth using. In fact, I am planning to use it with my children as we are discussing how to approach the Bible so that we can understand it better.